Today: If you’re used to getting your horseradish out of a jar, now's the time to try the real thing. Count horseradish among all of the other misleadingly-named produce; it’s not a radish, and it doesn’t have anything to do with horses (it’s actually poisonous to horses). The name preserves an old use of the word horse, as an adjective meaning "strong, large, or coarse." Horseradish is a brassica (along with turnips, rutabagas, broccoli rabe, and many more cool-weather-loving plants) grown for its taproot -- but the greens are edible too. 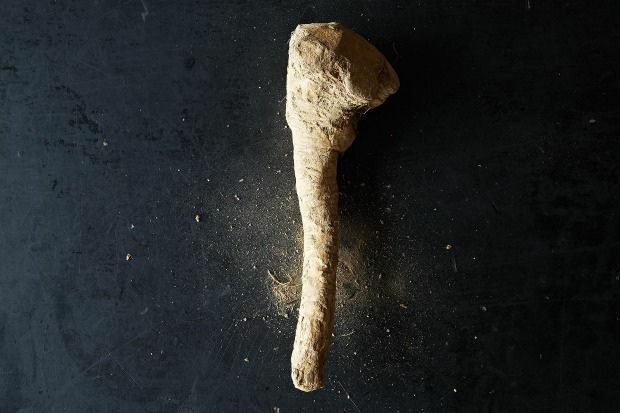 It's not the most attractive root on the block, but allegedly the Oracle of Delphi said, “The radish is worth its weight in lead, the beet its weight in silver, the horseradish its weight in gold.” We’ll take that as a prophecy to eat more horseradish in any form. More: Embrace another unattractive root -- start working burdock into your cooking repertoire. Select firm light brown roots -- avoid any with a green tinge, or that have sprouting, soft spots. Look for horseradish at farmers markets mainly in the spring and the fall, and at well-stocked grocery stores year-round. No luck finding the fresh variety? Prepared horseradish should be easy to find, too. You can substitute four teaspoons of prepared horseradish for every tablespoon of freshly grated horseradish -- prepared horseradish contains vinegar though, so be mindful if the recipe calls for vinegar or lemon juice, you might need to scale back. Horseradish will keep well in the refridgerator for up to two weeks. Wrap the root in a damp paper towel (or kitchen towel), and then place it in a plastic bag. Wait to wash it until you are ready to use it, and only peel (1) the amount you’ll need. If you cry when you cut onions, get ready. When horseradish is cut or grated it produces a volatile oil that can irritate your eyes, nose, and even lungs (This is an impressive self-defense mechanism to protect the plant against getting chewed by hungry critters.). 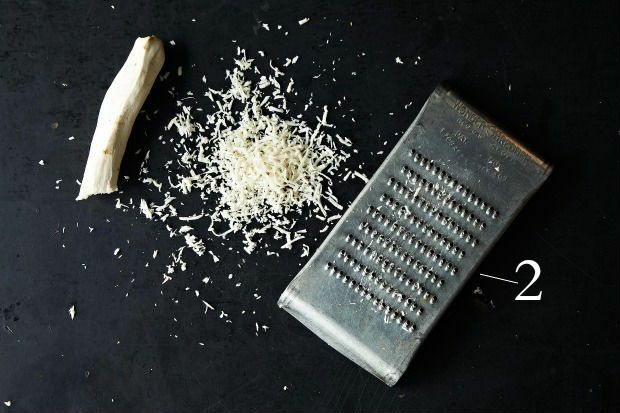 Grate horseradish at arm's length on the small holes (2) of a box grater or put your food processor to work if you'll be using a larger amount. Consider wearing the onion goggles you got as a white elephant gift. 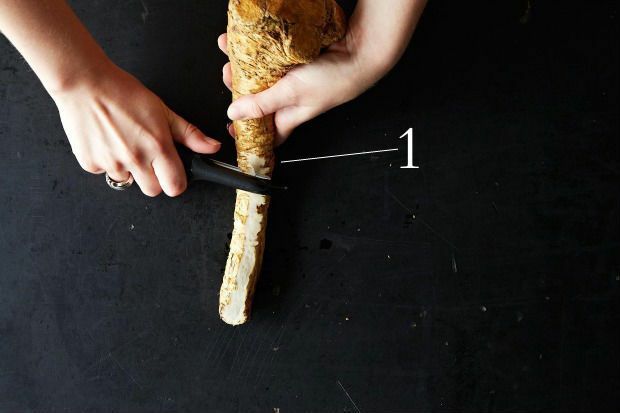 Elizabeth Schneider thinks our association with prepared horseradish is limiting our use. She suggests you keep a root on hand and "grate the dry, seasoning over everything until you find what it best suits.” It'll enhance a wide variety of foods -- just remember to grate the root shortly before eating, or its potent flavor will diminish, and the shreds will discolor. Horseradish is most often used as a condiment (it shows up in sauces, dips, and vinaigrettes), especially with roast beef. Of course you don’t need to stick to just plain horseradish sauce -- mix it up in a sauce with apples or use fresh horseradish in a compound butter. Remember horseradish when spring rolls around again -- it pairs well with other heralds of spring like asparagus, snow peas, and shelling peas. Use it fresh in drinks too, like a classic bloody mary -- or make horseradish vodka. Mark your calendar for next summer’s horseradish festival, and then get into the kitchen and enjoy horseradish all week long.